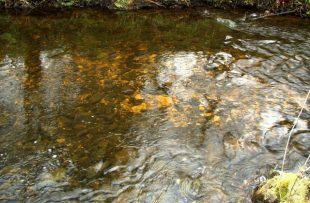 Every year usually between November and January the rivers of the North East are full of life as Salmon, Sea trout and Brown trout come to lay their eggs in the oxygen rich, clean gravels. A typical salmon spawning area with the lighter area recently disturbed by fish (Redd). Following long journeys back to their familiar spawning grounds the fish use their tails and bodies to create holes in the gravel and cobbles (known as Redds), depositing and fertilising the eggs before they are covered again with gravel by the female fish. The eggs develop over the winter time and hatch in the spring. This is what provides the next generations of Salmon and Trout. It is important that both the breeding fish and the eggs they lay are undisturbed until the eggs hatch and the fish are able to swim freely. In fact the law protects the fish and eggs at this stage from disturbance and damage. Often you may be unaware that beneath the river bed millions of salmon eggs are developing and hatching. 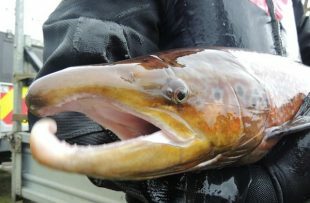 A male salmon in breeding condition. Photograph courtesy of Kielder Salmon Centre, Northumberland. Nationally, and internationally, salmon stocks are in decline so all efforts are required to protect this iconic species. In order to help address this decline the Environment Agency, together with Government and partners, are committed to taking action and have launched the Salmon Five Point Approach seeking to improve their survival at all life cycle stages. The Salmon Five Point Plan includes, measures to preserve water quality, safeguard river flows, reduce exploitation and protect habitat, including the gravel beds where the salmon and trout breed. You can read about the plan here. This is why, when the Environment Agency issues a permit for working in rivers, or when we carry out our own essential work, we need to protect the eggs from disturbance or from silt that can starve the eggs of oxygen. In the winter months, while the fish are spawning and the eggs are developing, we may place conditions on working methods that to some may seem frustrating or appear unnecessary. It is in fact these conditions and restrictions that will help protect the breeding fish and their eggs. Examples of these conditions could include ensuring work is undertaken in the dry, noise and silt is minimised and migration routes for the fish are maintained or improved. We would also utilise existing fish survey data to monitor stocks and assess the risks that they face. Salmon eggs and recently hatched fish. Photograph courtesy of Kielder Salmon Centre. 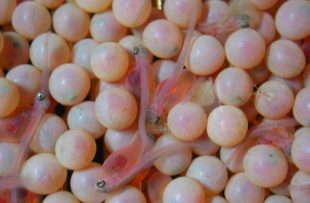 In some cases where the working methods and conditions cannot adequately protect the fish we may decide to delay the work until after the eggs hatch. Of course we must balance the need to protect the environment alongside essential works that may be needed such things as emergency repairs to bridges and railway lines, repairs to gauging stations used for flood warning, construction or repairs to fish passes and protecting property and lives from flooding. Our experts will always assess all the risks and make the appropriate decision, in conjunction with partners where necessary. Our top priority is always protecting people and properties from disasters such as flooding. If you would like more information regarding working in rivers please contact your local Environment Agency office who will be able to advise you regarding any permits that are required to protect the river environment.